First Blood and the Unfolding of Serena — PULP. The title of this week’s episode of The Handmaid’s Tale, “First Blood”, could be taken in many ways. 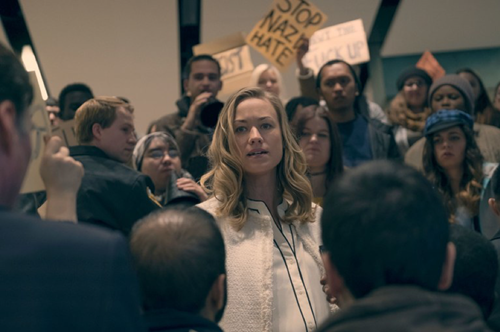 It can relate to the first time Nick consummates the marriage with his 15-year old bride Eden, or maybe the sign of the fight about to come as we see the beginnings of the Handmaids’ collective revolt. Whichever way, this episode is certainly as evocative and hard-hitting as the title suggests. The episode starts with June/Offred getting an ultrasound. The doctor explains that she had haemorrhaged, clearing up the speculation of the previous episode that she suffered a miscarriage. The doctor speaks directly to Mrs Waterford when talking about the baby, condescendingly ignoring June. However, Serena is surprisingly inclusive. She shows June the image of the baby, and then takes her home, comforts and waits on her, knitting whilst Offred takes rest on the couch. Their relationship is seemingly thawing. There is a moment where Serena asks her what it feels like to have a life growing inside her. For a moment you could mistake the pair as friends and equals, especially when Offred invites the Wife to feel her stomach. Offred takes the opportunity and asks Serena if she could see Hannah, just once, to know that she is okay. Here, the mood instantly and dramatically shifts. Serena refuses, reverting to her ice-cold disciplinarian role. This episode also leads the audience into greater insight about Mrs Waterford’s past – a character I have long wondered about. Flashbacks take us to a younger Serena who is about to commence a speech at a college. She’s on a tour for her book A Woman’s Place, which has been alluded to in previous episodes as her contribution to the ideology of Gilead – although she was eventually banned from participating in the government which she helped create. She is faced by a crowd of outraged students, holding posters reading “U Are Not Welcome Here”. She is forced out of the hall, unable to speak to the students. She screams that the rates of healthy births have dropped over 60 percent in the past year, and that the students are spoiled and privileged. In the climax of this flashback, Fred and Serena cross the path of a sniper, who shoots Serena in the stomach. Although “First Blood” most stuck with me for the insights about the character of Serena Waterford, this was far from the only plotline in this busy episode. We saw Nick and his new bride, with the young girl relieved to finally spend the night with him after worrying that she may have to report him for being a “gender traitor” (gay). Further, Serena shows June the nursery she has tastefully decorated, highlighting Serena’s anxiety and impatience to finally have a baby in the house and fulfil her role in society. And then the final scene: incredibly impactful. Fred has been working on a project constructing a new state-of-the-art building to increase Gilead’s capacity to ‘process’ more Handmaids – a stark reminder of the commodification of fertility in this new world. On the occasion of this building’s opening, Handmaids are lined in a circle around a crowd of men in suits ‘celebrating’ the opening. Interrupting the speech, Ofglen – the Handmaid whose tongue was cut off – walks into the main room and launches a suicide bomb. As the Handmaids run away, there is a large explosion – and we then cut to the credits. This act will undoubtedly alter the plot’s course, especially if the innuendo that Fred is killed in the explosion is indeed correct. 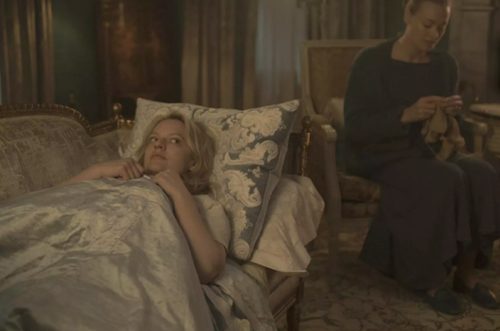 Without Fred to mediate between Offred and Serena at home – and with Serena coming to terms with her husband’s death – there is sure to be more tension. Moreover, this moment marks protest from the Handmaids, which is bound not to go unpunished. And that’s the wrap up from Gilead. Until next week.